Arq Backup 5 is tool made to back up your Windows or Mac PC locally or to various online storage services. This article is an Arq Backup Review of version 5.7.23 on a Windows 10 PC. Arq Backup is a tool that lets you back up all your computers to various online storage services, to your internal disks, to a NAS, or to external hard drives. 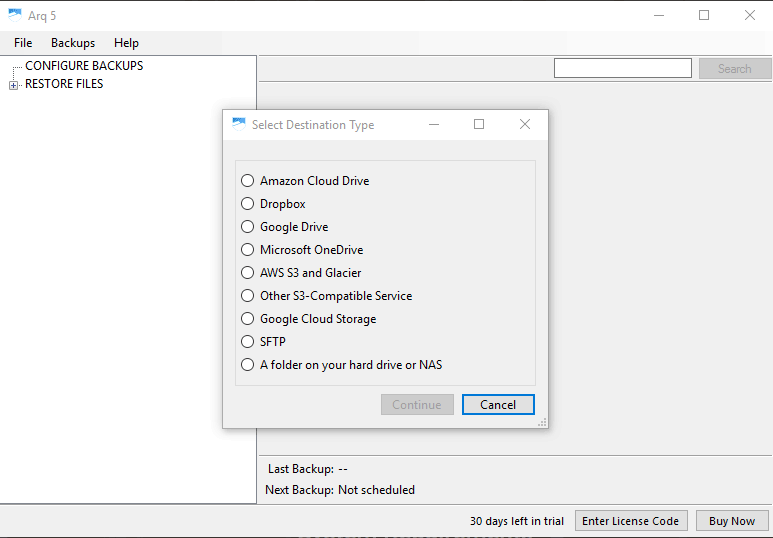 Arq doesn’t provide this backup storage, it lets you use Amazon S3, Dropbox, Google Drive, etc. Technically Arq is excellent, doing compressed, encrypted, deduplicated backups that are small and secure. Arq on Windows has a quirky user interface that works fine, but could use some work. It really seems like it was designed and built by an engineer. Technically excellent implementation of deduplication. Provides an open, documented data format. Easy to use, though a slightly quirky user interface. The user interface could easily be optimized to be faster and easier to use. Developed and maintained by a single developer, which introduces a little extra risk of the software becoming unsupported. I found one major bug during my evaluation that prevented any backups running at all. This was fixed in 1-2 days by the developer. This is very responsive, but it’s surprising that a mature tool has bugs this serious. I found another minor user interface bug that he couldn’t reproduce. Large backups and validation can be a little slow, but the performance is generally acceptable. There is virtually no documentation or information about how to use the software, or how the software works. When I asked about deleting old versions automatically the support person didn’t appear to know about the thinning backups setting in advanced options. Ease of use isn’t great. I don’t believe it’s suitable for the average person. It’s really a tool for competent to advanced computer users. Overall Arq is a technically excellent piece of backup software, with a few quirks that could be improved. The user interface, bugs, and lack of documentation are the main reason I chose not to use it as my main backup tool. However it would be a good choice for many people. Runs on Mac OS-X and Windows. 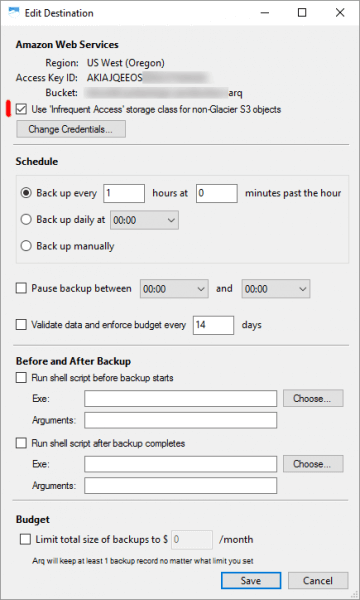 Allows scheduled or manual backups. Mandatory data encryption, and optional data compression. Provides incremental, de-duplicated backups. This means only changed data is backed up, saving backup time and storage space. 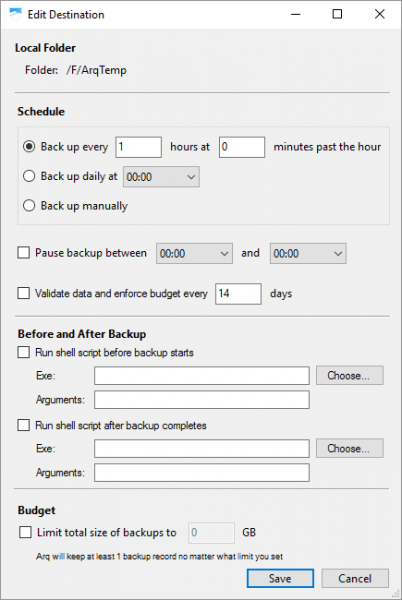 Provides a single backup mode, which is block level and de-duplicated. There’s no option to simply copy files to the backup destination, so you need Arq to decrypt the backups. Provides generally sensible defaults, making things easier for non-expert computer users. Advanced users can change many of these defaults. The user interface is quite quirky and not particularly intuitive (see more about this below). Doesn’t allow upload block size changing for AWS S3. S3 charges you per block uploaded, so using larger blocks can reduce your bill. The block size isn’t specified or configurable, but is likely in the low tens of megabytes. Backups can be a little slow. 300GB of files took approximately half a day to backup to another internal disk, with my disk working at 7% and the CPU at 35%. There’s no progress indicator on backups or validation. Backup validation appears to be single threaded. My computer sat on 1/8th CPU of an 8 core machine for hours validating backups. Arq appears to be developed and maintained by one person. The developer is clearly very capable and responsive. However, as all software needs to be maintained this introduces risk compared with products that are released by an organisation with multiple developers. I don’t know for sure what Arq does with files that are deleted on the file system. Presumably it keeps the file in the backup destination, and it’s never deleted, but the documentation is poor so it’s difficult to find out. I was tempted to email support, but they take a couple of days to reply and I didn’t want to waste their time. Compared with CrashPlan, I find Arq more difficult to use and less capable. However Arq has one major advantage over CrashPlan – when you plug an external drive used for backups into your PC CrashPlan validates all the data on it, which can take many hours for large backups. That means CrashPlan is fine for online backups, but isn’t really suitable for backing up to external drives. Arq isn’t particularly difficult to use, but neither is it particularly easy. Having to provision backup storage separately from the backup tool would confuse many people. Setting up Amazon S3 and IAM users would baffle anyone who’s not an experienced or expert computer user. Putting aside setting the backup storage destinations, the program could be used by anyone who considers themselves “pretty good with computers”. I know that if my 65 year old parents tried to use Arq for backups they’d be completely stumped. The poor documentation doesn’t help with ease of use. To define a backup destination you have to go into the “preferences” menu, rather than having it a part of the core user interface. 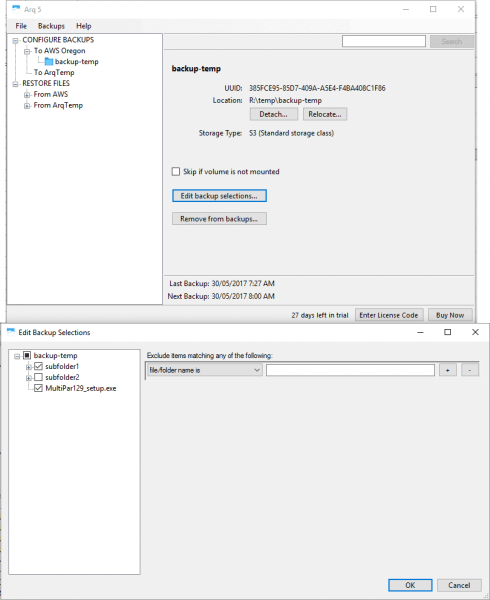 When you define your backup destination you don’t get to see options, such as using S3 infrequently accessed storage class. You have to create your destination then edit it to configure it. S3 IA class should probably be the default storage class rather than S3 standard, but it’s not. You can only backup to one destination at a time, and you can’t queue additional backups. I backup to external disks, and I have multiple large backup sets so as not to have too much data backed up in one set. I can’t run backups to the external disks overnight, because I have to start each backup manually. This isn’t really a big problem as incremental backups are quite quick, it’s just an annoyance. Validation of backups and removing old files is similarly restricted. Operations aren’t context sensitive. 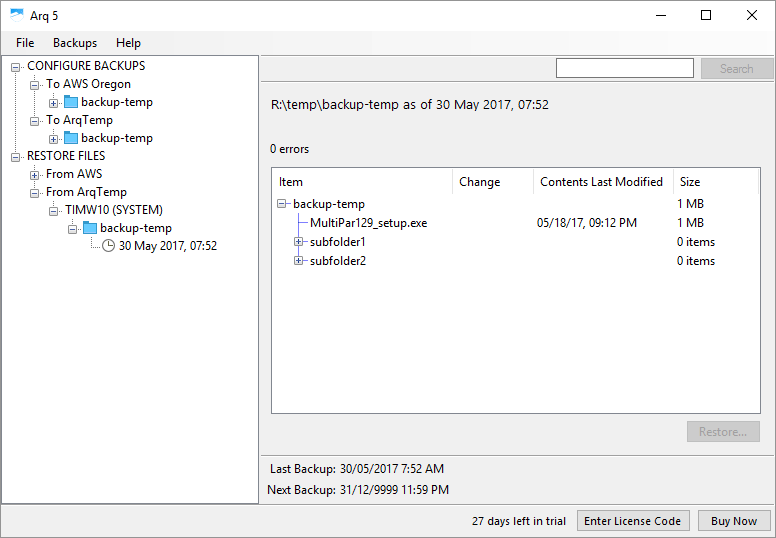 For example you can’t start or validate a backup from the backup destination screen, you have to use the drop down menus. 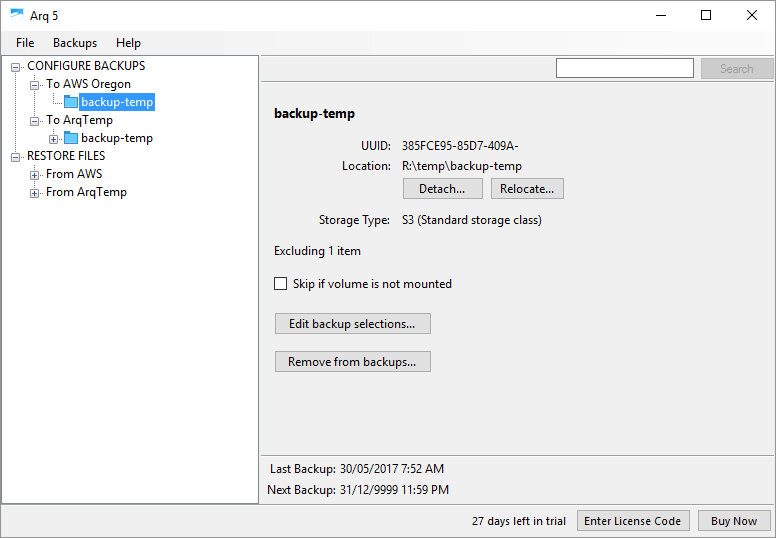 The last backup date/time isn’t clearly shown on the backup destination, you have to go into the menus to find the logs. This may be because it’s really focused on automated scheduled backups rather than backups to external disks. Backup destinations don’t have configurable names. The label for a backup destination is the folder name or a label such as “AWS Oregon”. If you have multiple backups to similar destinations this gets confusing. On the main screen, if an S3 destination is configured to store files in the Infrequently Accessed storage class, Arq refers to this as S3 (standard storage class). I imagine this is to distinguish between regular S3 the Glacier storage class, but it’s misleading. In most cases initial setup gives you few options. To configure details you have to do the main action, then edit or configure it. This is the case for destinations and backup selections. It’s not really a problem, and is probably more user friendly, but this tool is really aimed at power users or computer experts, so it just increases the time and frustration. Let’s walk through the major parts of the Arq user interface. This first screen shows the initial view when you install the software. This lets you set up your first backup destination. If your destination is an S3 bucket you need to enter your access and secret keys, then select or create your bucket. Arq links to a brief web page that shows you how to set up your IAM user, but it doesn’t give a lot of context about setting up an AWS account. You can edit your destination if you want to use IA class storage, schedule your backups, schedule validation, or do a few other things. If your destination is a folder you get similar options. Once destinations are set up you can see where to, and when they’re scheduled to back up. Once the destination is set up you can configure what you want to set up. If you want to make multiple selections, or remove subfolders, that has to be done later. 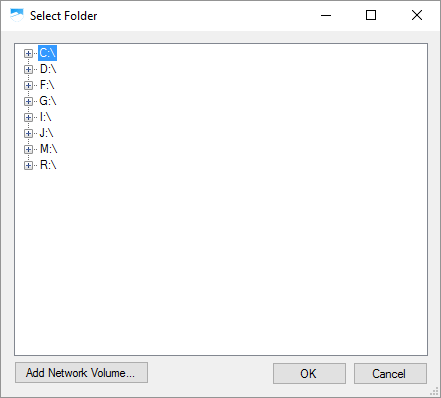 Now that a folder is added you can edit the selection, including deselecting subfolders and files you don’t want backed up. This shows the main screen when you run Arq, after its configured. You can see you can edit backup selections, or do advanced functions like detaching or relocating backups. Restoring files is relatively simple. Simply navigate the tree, select the files or folders you want restored, and click restore. Compression and deduplication is a strength of Arq. The block based backups are excellent, well compressed, and deduplication works very well. Technically it’s probably the best of the backup programs I tested. Adding files that were already in another part of the backup set took virtually no storage space. Backups of large raw files from my internal hard disk to an internal SSD went at around 22MB/sec on average, with 35% CPU usage on my i7-2600K CPU. Backups of large virtual machine files was a little faster at 25MB/sec. Given the drive can read over 100MB/sec and there was plenty of CPU available this is underwhelming performance, though not awful. A 300GB backup took around 4-5 hours to complete. Other backup software tested averaged 45MB/sec for small file backup and 110MB/sec for large file backup. This backup performance is acceptable, but not near the best available. I did a test restore from Amazon S3 using a brand new virtual machine, and from disk to a different PC. Both restores were quick and easy. Arq Backup 5 is a solid backup program. It has a slightly quirky interface that’s effective but has plenty of room for improvement. Arq seems to be aimed at scheduled backups to online storage or internal disks, so regular interaction probably isn’t expected. Backing up to external disks works, but isn’t as efficient as it could be as backups can’t be run in parallel or queued. Backup performance is acceptable, but it would benefit from some performance work. In my opinion Arq is more suited for experienced computer users than for beginners. Anyone who doesn’t consider themselves a computer expert would struggle. Hey, exactly my thoughts, UI could easily be better and is a bit weird. If it turns out to be rock solid on the technical side, I will still love it. But currently I face some problems, where it cannot see backup sets which have been done by a different computer and vice versa… hope this will be sorted out with their support. I contacted their support twice. They were quite responsive, including releasing a new version when I found a bug. I think they’ll sort you out. I did like the Arq documented their backup format well, not many companies do that. In general their product documentation is about as poor as I’ve seen though. I think their technology is excellent, let down by a substandard user interface and usability. I’m looking for a Crashplan replacement so it was nice to see a well thought out review.